An explosion caused by fireworks killed more than 100 people at a temple in the southern Indian state of Kerala early Sunday. Thousands of people had gathered at the temple near the coastal town of Paravur to watch the fireworks, part of a yearly religious celebration. Officials said some of the fireworks fell on a building where a large number of fireworks were being stored, causing explosions and a fire that spread quickly. Many more people were injured as they ran from the fire. A government official said the temple had not been given permission to hold the fireworks display. Prime Minister Narendra Modi brought a special team of doctors to the area to help those who were injured. In a tweet, Modi called the fire "heart-rending and shocking beyond words." He added, "My thoughts are with the families of the deceased and prayers with the injured." Cavities in teeth are caused by decay. The bulk of the work will fall on you and me. He threw down his rifle and ran from the battlefield. 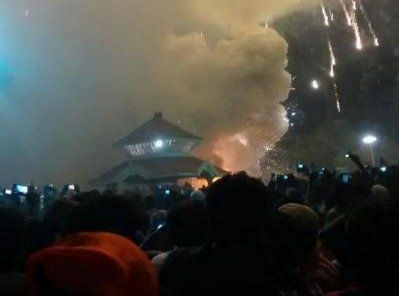 1.Thousands of people had gathered at the temple near the coastal town of Paravur to watch the fireworks, part of a yearly religious celebration. I get thousands of letters from girls saying that I inspire them. It has also been tested by thousands of other programmers. 2.Officials said some of the fireworksfell on a building where a large number of fireworks were being stored, causing explosions and a fire that spread quickly. They have retrained a number of young technicians for our factory. A large number of students are ill these days because of the swine flu.